Proper fence installation is necessary for a reliable, long-lasting fence. Therefore, we strongly encourage new fence installers to view our exclusive library of installation videos before beginning a project. And, for further help, we recommend utilizing other online tools like our Fence Calculator and Installation Blog Posts. If installing fence on your own is not an option, check out our list of Certified Fence Installers(CFI) at rebrand.com. 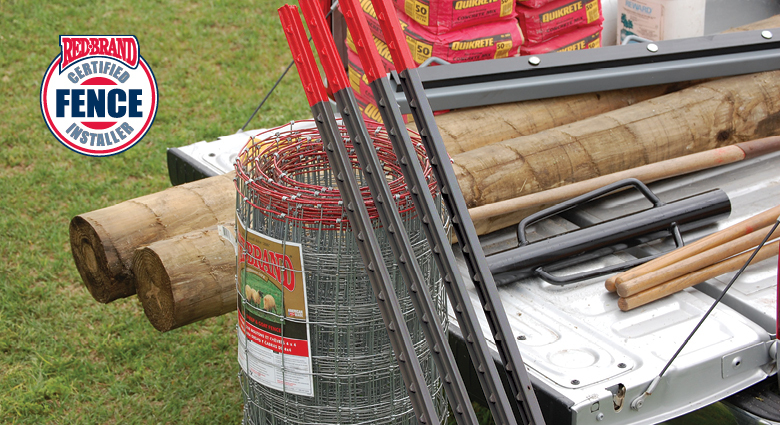 Every Red Brand certified installer has applied to, and been vetted by, our own fence professionals. As a result, each CFI is assured to bring out the most in your premium fence. It doesn’t matter what animals you are fencing in, or the terrain challenges your property may present. Either way, a Red Brand Certified Fence Installer can ensure an elite installation that maximizes your investment. What is a Certified Fence Installer? To become a CFI, an installer must meet Red Brand’s high standards for excellence. Experience, fence knowledge, credibility, locale, and any state-required certifications are all considerations for making our list. We established this program to help connect property owners with quality fence installers. It’s important to Red Brand to select contractors who respect quality and workmanship as much as we do. Therefore, by working with a CFI, you are assured that Red Brand’s attention to detail extends all the way to the installation of your fence. Why Should You Hire a Red Brand Certified Installer? We know that purchasing and installing Red Brand fence can be a considerable investment in your property. But, it’s a crucial one. That’s because your fence is your animals’ first line of defense against predators and other dangers. Safety and security are paramount. Through verified installation techniques, a CFI will maximize your fence’s longevity and strength. A professional installer can give your top-of-the-line fence the foundation it needs to serve your property for years to come. The Red Brand CFI program is open to qualified full-time ag fence contractors. But first, all applicants are required to verify their credentials through a certification process. After acceptance, newly certified installers will receive a welcome kit with the opportunity to order the following business materials that will help to promote business. In addition to the marketing materials provided, contractors will also benefit from referrals. Our online Installer Locator database at redbrand.com helps property owners find local professionals. Red Brand also offers ongoing technical support to contractors. This service provides advice and guidance on how to confidently select and install Red Brand fence. For more information on this program, click here. Find a Certified Fence Installer near you. Getting the right fence installed correctly helps to ensure your fence works properly and lasts a long time. That’s why we’ve partnered with fence installers who value high standards and workmanship as much as we do. So, by choosing Red Brand fence products and using the CFI referral database, you can be confident in your fencing investment. Click here and enter your zip code to find a Certified Fence Installer near you.